London, United Kingdom – 13 November, 2018. 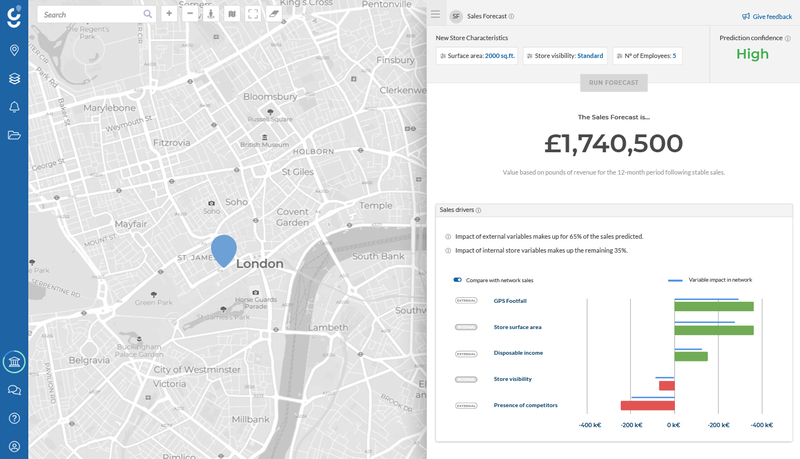 The Location Intelligence startup, Geoblink, has announced today the release of its latest product feature that predicts the sales of potential retail locations. The functionality, called “Sales Forecast”, was developed to help retailers select the ideal site to open the next establishment in their retail network. This feature provides Geoblink’s clients with the information needed to understand how a new establishment will perform in a certain area. “Sales Forecast” has been launched at a crucial time for the industry, where the need for precise data that provides strategic foresight is essential to stay ahead. Through advanced predictive modelling and Artificial Intelligence techniques, “Sales Forecast” displays a monetary prediction (in £) of a location being evaluated on a simple and sleek interface. The sales prediction model built for each client is tailored to the realities of their business and based on real and objective data. Geoblink’s clients who use the functionality will be able to easily obtain sales predictions for any retail site under consideration at any time. The new feature also shows the client how a potential new store location compares to other stores within their existing retail network. This critical insight, in turn, can be used to determine the resources necessary to maximise operational efficiency and accelerate the time it takes to open a new store. Having this key information beforehand is what will help retailers to strategically expand their businesses in this ever-evolving retail landscape. Moreover, “Sales Forecast” determines which key factors contribute to the way a potential establishment will perform in a specific location. This means that retail clients using the feature will be able to understand the individual components that make up the market dynamics around a retail site under evaluation. These factors shift depending on each unique location and consist of various elements such as the overall income level of the area, amount of footfall traffic the location receives, size of the establishment, the existence of nearby competitors and more. Identifying the factors that will influence the performance of a new store opening in a particular location is what will streamline the market research process and take expansion strategies to an entirely new level. Founder and CEO of Geoblink, Jaime Laulhé, comments on the latest feature announcement and adds: “In this hyper-competitive retail climate, carrying out a successful expansion plan all comes down to choosing the right locations. We are pleased to announce the launch of our new Sales Forecast feature that has been designed with this in mind, so our retail clients can instantly access the data they need to confidently take those decisions and sustainably grow their businesses”. Geoblink is the Saas-based Location Intelligence solution that enables professionals from the retail, FMCG and real estate industries to take informed decisions about their business strategies. With its easy-to-use and visual interface, Geoblink’s advanced data capabilities and predictive technology empower companies of any size to perform in-depth market research and gain strategic insights in a matter of minutes. This competitive business intelligence is what helps these professionals to maximise the efficiency of their store networks, make accurate sales forecasts as well as optimise their distribution, marketing and expansion strategies. Geoblink’s Location Intelligence platform serves many brands such as Danone, KFC, Papa John’s, Carglass, CBRE, Amrest and Restalia, among others. This press release was distributed by ResponseSource Press Release Wire on behalf of Geoblink SL in the following categories: Food & Drink, Business & Finance, Retail & Fashion, for more information visit https://pressreleasewire.responsesource.com/about.